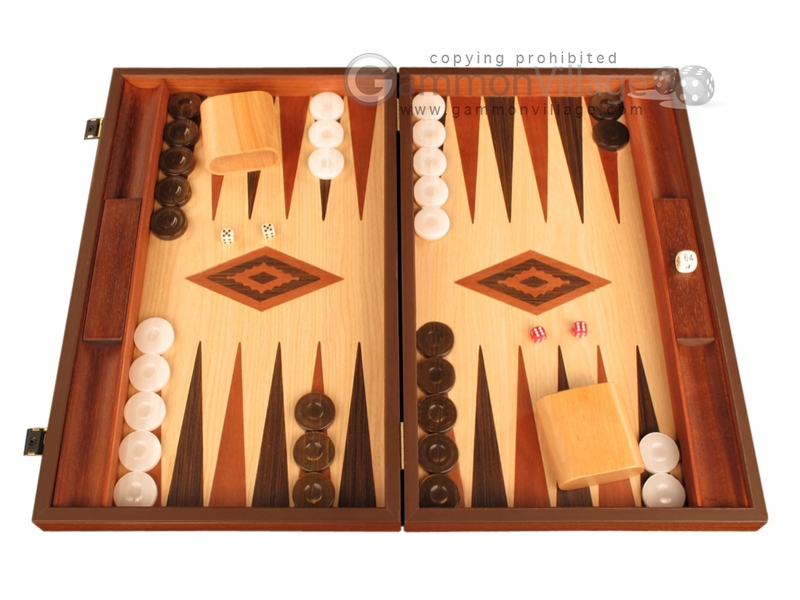 This large wenge backgammon set features a meticulously inlaid oak playing field, with mahogany inlay for point 1, and brown wenge inlay for point 2. The case trim and checker trays are finished in solid mahogany. Most noticeable in these new Manopoulos sets are the heftier, 8mm checkers, weighing 30% more than previous models. The new upgraded latches are durable, attractive, and easy to open/close. The exotic wood veneers have all been hand-selected, with careful attention to color detail and checker co-ordination. The end result, as you can see, is nothing short of spectacular. That's the GammonVillage design team, working for you. Closed Length: 18 3/4" Width: 11 3/4" Height: 3"
Open Length: 18 3/4" Width: 23 3/4" Height: 1 1/2"
Page P5243 Copyright © 1999-2019 GammonVillage Inc., USA. All rights reserved.